The life of Lusinia Anne Rose has always been infused with love for animals, plants and people, and with searching for and finding her love for herself. From this love emerged a deep connection with the spiritual world. In 2008 Lusinia and her husband walked the Way of St. James. 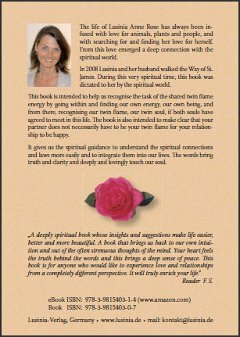 During this very spiritual time, this book was dictated to her by the spiritual world. 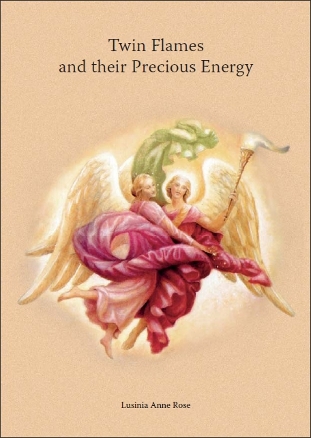 This book is intended to help us recognise the task of the shared twin flame energy by going within and finding our own energy, our own being, and from there, recognising our twin flame, our twin soul, if both souls have agreed to meet in this life. The book is also intended to make clear that your partner does not necessarily have to be your twin flame for your relationship to be happy. It gives us the spiritual guidance to understand the spiritual connections and laws more easily and to integrate them into our lives. The words bring truth and clarity and deeply and lovingly touch our soul.